This elegant, superior quality Fakro LWP Insulated Wood Attic Ladder fits in R.O. 22.5-inch x 47-inch and ceiling heights from 7 ft. 5-inch to 8 ft. 11-inch It is built from quality pine and fully assembled. Locking mechanism installed inside an insulated and sealed door panel ensures the attic entry is airtight while closed to avoid energy loss. The ladder length can be adjusted within 1.3-inch even after cutting the side rails, this allows for perfect fit to ceiling height and additional adjustment after floor renovation. Eleven steps feature a tread rise of about 10-inch to ensure safety and comfort. Included red metal handrail provides additional security and can be installed on either side of the ladder. Specially designed door attaching brackets provide additional space for a foot and unique springs design moves the springs down with the ladder's door to make attic entry wide and comfortable. Double safety features! Climb in and out of your above ground pool easily with the 52-in A-Frame Ladder. This economical "A" frame style ladder has all the features of a more expensive ladder at a price that is easy on the wallet. Designed for above ground pools up to 52-in deep, this tubular steel ladder with Blue steps is lightweight and easy to assemble. Safety features include removable outside steps to prevent unwanted pool entry, and a safety barrier behind the inside ladder to prevent swimmer entrapment. The large top platform and rounded handrails add to the ease of getting in and out of your pool. Perfect for soft-sided, metal frame pools! Elegant, LST powder-painted metal scissor ladder, high quality with attention to details, assembled in three sections. The LST is a scissor ladder with a white insulated hatch. Its construction takes up less space and requires less room to unfold, making it perfect for small spaces. LST ladder is equipped with locking mechanism that is installed inside insulated and sealed door panel. Length of ladder may be adjusted within 1.3 in. after cutting the side rails to set ladder evenly on floor or if adjustment is needed following floor renovation. Construction of ladder provides more steps (tread rise about 10 in.) to improve safety and comfort. Can add up to 2 additional steps to bring ladder height to 10ft. 10in. Red, metal handrail may be installed on either side of the ladder to increase safety and comfort. Brackets allow increasing space between ladder and attic door for comfort and safety. Springs are located on door surface to make entry to attic wider and more comfortable. 8 ft. 11-inch, 22.5-inch x 47-inch Insulated Wood Attic Ladder with 300 lb. 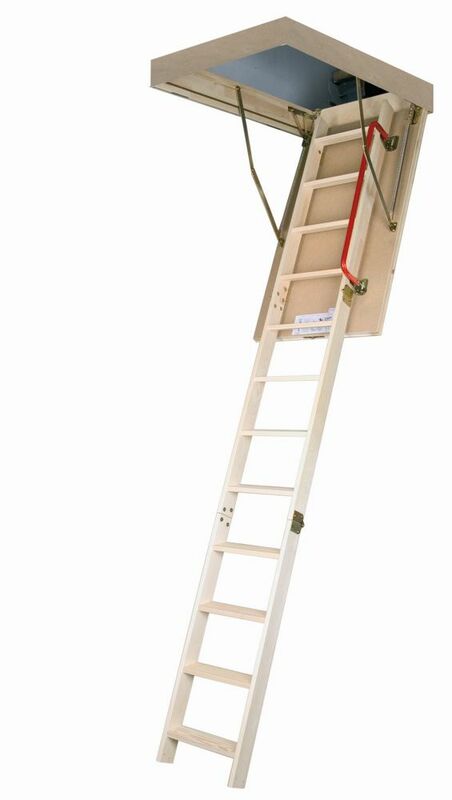 Capacity Type IA Rating This elegant, superior quality Fakro LWP Insulated Wood Attic Ladder fits in R.O. 22.5-inch x 47-inch and ceiling heights from 7 ft. 5-inch to 8 ft. 11-inch It is built from quality pine and fully assembled. Locking mechanism installed inside an insulated and sealed door panel ensures the attic entry is airtight while closed to avoid energy loss. The ladder length can be adjusted within 1.3-inch even after cutting the side rails, this allows for perfect fit to ceiling height and additional adjustment after floor renovation. Eleven steps feature a tread rise of about 10-inch to ensure safety and comfort. Included red metal handrail provides additional security and can be installed on either side of the ladder. Specially designed door attaching brackets provide additional space for a foot and unique springs design moves the springs down with the ladder's door to make attic entry wide and comfortable. 8 ft. 11-inch, 22.5-inch x 47-inch Insulated Wood Attic Ladder with 300 lb. Capacity Type IA Rating is rated 4.6 out of 5 by 76. Rated 3 out of 5 by H1 from I might have recommended this product if the installation instructions were not completely accura... I might have recommended this product if the installation instructions were not completely accurate or more informed. I did hire a person to install inside my closet ceiling. The problem is they did not say when the ladder was extending that the clearance at when the ladder opened had to have a larger clearance. It had a measurement of 64 inches for R measurement and from that description we worked on installation only to discover that the ladder extended further and we had to readjust the attic opening back 12" to accommodate this problem and then had to change the lighting for the closet as it was in the way. I think they need to give more measurements as people buying this ladder I would assume from the small measurements that tthey are putting in a tight space. The item arrived in good condtion and I did not see any issues so far with the construction but as I am in the middle of installation and as handyman has to make more changes to the constuciton I feel compelled to write this note. I would suggest in addition to the drawings and video that they make it very simple Listing A. what you need to buy B. what to have on hand C. exact size of clearance for all angles of this ladder. D. where to locate foot pads for the bottom of the ladder. Rated 5 out of 5 by Jolie from Amazing ladder! Been cold lately outside and was concerned that... Amazing ladder! Been cold lately outside and was concerned that framing and installing stairs would invite the cold in. I am pleased to say it didn't. Very sturdy build. Rated 5 out of 5 by HomeDepotCustomer from Well built. Easy operation. Fits smaller openings.... Well built. Easy operation. Fits smaller openings. Rated 4 out of 5 by TheSeeker from Stairs are very well made, well packaged, arrived with no damage. Corners perfectly square, insul... Stairs are very well made, well packaged, arrived with no damage. Corners perfectly square, insulation panel and seal are excellent, locking system is great with no cord hanging down. Installations instructions are very difficult to follow with half in English and half a picture book without words as they are sold in many countries. Just call the company, their technicians will explain what is missing from the manuals. They told me they were in the process of rewriting them which is needed. Installed a few weeks ago. Rated 2 out of 5 by NotEasy1 from The insulated cover stands out along with the fact that it was the correct size for the existing ... The insulated cover stands out along with the fact that it was the correct size for the existing opening. The attic ladder frame was found to be damaged when unpacked for installation. This caused extra contractor effort and time to keep the project moving. It was not packaged well and it was not handled carefully by HomeDepot delivery processes. The sizing was accurate.